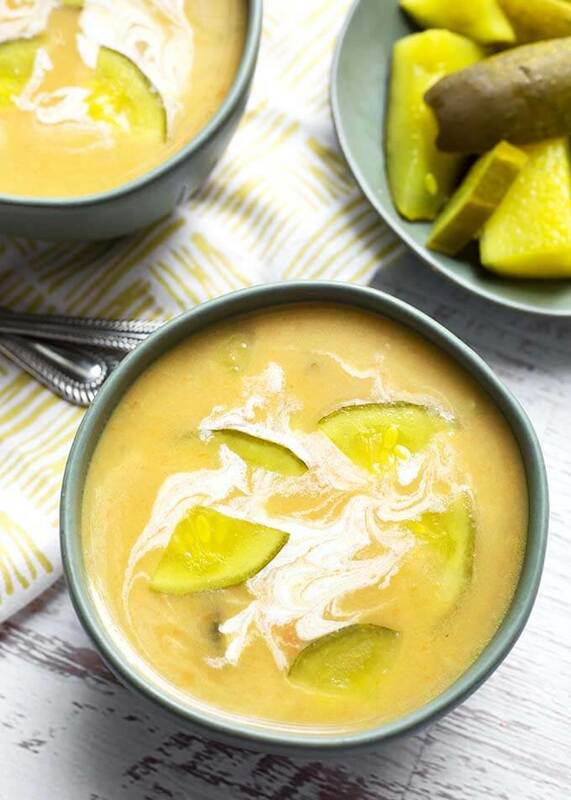 Instant Pot Dill Pickle Soup is a comforting, creamy soup with a tangy kick of dill pickles. But not too much! 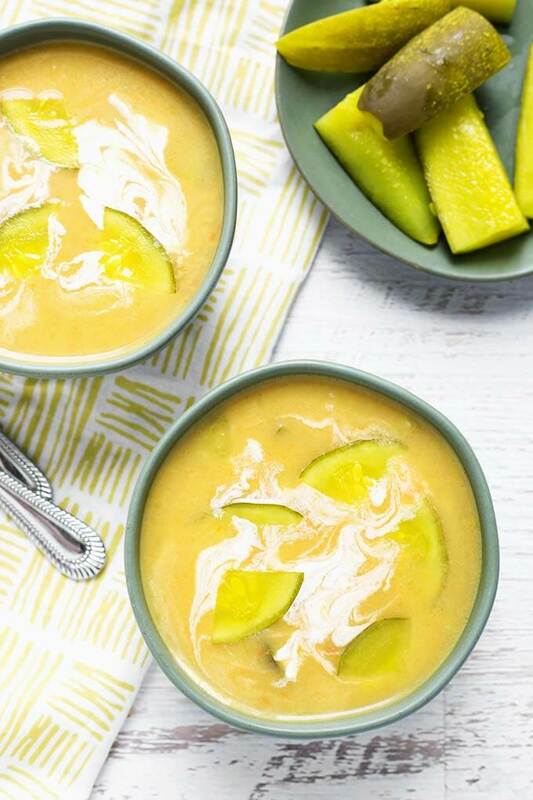 When you make this flavorful pressure cooker dill pickle soup in your Instant Pot, it will be done in minutes. and The bonus is that it’s a dump and start soup! If you have followed me for very long, you may know that Instant Pot soups are a passion of mine. I eat soup all year long, and am often devising new and interesting recipes. Here’s a rather unusual one for you: Instant Pot Dill Pickle Soup! 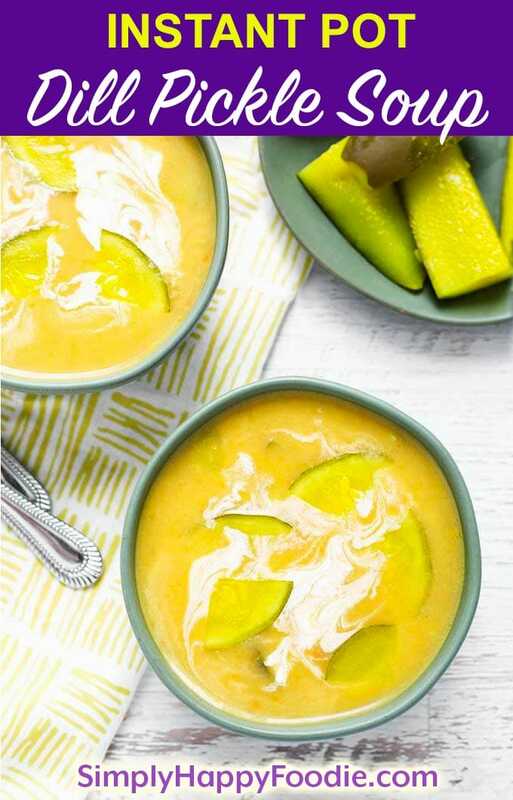 I promise, if you like dill pickles, you will like this soup! My local farmers market, where I’ve been going since I was a baby (mom shopped there, grandparents shopped there) posted about their Dill Pickle Soup. What? Have I been living under a rock? I love dill pickles! What is this soup you speak of?! I HAD to try it, and in the Instant Pot of course. I had everything I needed, so I made a half batch in my 3 quart IP, to see what the baseline was. I was a little nervous. What if I hated it? Well, when I released the pressure, and smelled it, I KNEW it was going to be good! And it was. I made some tweaks to suit my taste, and you probably will, too. I made a couple more batches and finally decided on my favorite. I’m adding Instant Pot Dill Pickle Soup to my recipe collection. I really like it! Now if you are not a fan of dill pickles, then this may not be the soup for you. However, I urge the pickle fans in the crowd to give this Instant Pot Dill Pickle Soup a try. It’s a dump and start recipe, after the initial chopping. It surprised me that my husband Paul liked this soup! When I told him what I was making he said it didn’t sound very good. Well, he tried it and ate a whole bowl. Then had seconds. And he took some for his work lunch the next day! He ate more of it than I did! 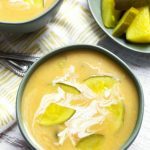 Instant Pot Dill Pickle Soup is a comforting, creamy soup with a kick of dill pickles. But not too much! Make this pressure cooker dill pickle soup in minutes, and it's a dump and start soup! Add all ingredients to the pot except pickle juice, salt, heavy cream & flour. Put the lid on the pot and set the steam release knob to the Sealing position. Press the Pressure Cook/Manual button or dial, then the + or - button or dial to choose 5 minutes. High pressure. When the cook time is finished, let the pot sit undisturbed for 10 minutes (10 minute natural release). Then turn the steam release knob to the Venting position, in short bursts, doing a controlled quick release, until you are sure that only steam, and no soup will spew out of the vent with the force of the release. Use an immersion blender to blend soup. If you don't have one you can mash it with a potato masher, or carefully blend in a blender, in small batches. Taste, add pickle juice in 1/4 cup increments until it's the right amount of pickle flavor for you. Add salt if desired (my pickles aren't salty, so I use 1/4 tsp, and that's enough). Mix together 1/4 cup of flour with 1/4 cup of the cream (mix it really well so lumps are gone). Then turn on the pot's sauté setting and stir in the mixture. Stir until it thickens. Use more in equal amounts if you like really thick soup (though, this isn't supposed to be that thick). Turn off the pot and serve. Finish off with cream to taste, if desired. I just garnish with it. Inspired by Farmers Market of BWA "Dill Pickle Soup"
I have read a lot of cookbooks and have never seen dill pickle soup. And I’m happy to say that now I know about this kind of soup! Potatoes and carrots go great with the flavorings in dill pickles. The actual form of the soup will depend on the type of pickles used — if I had really crispy ones, I’d probably save 1/4 cup as a garnish to bring some crunchiness. Next time I have a container of pickles, I’ll try to remember to try this (though on the stovetop, since I’m Instapot-less. Hi Marc, thank you for your comment. I agree about the type of dill pickle changing the soup. I would go with the brand/recipe of dill pickles that you love, and make the soup from them. The extra pickle garnish is a nice accent! Yum! I just got an instant pot last week and this is my first recipe with it, I was so happy with the outcome, this was such a delicious soup! Thanks for sharing! Hi Sam, I’m really happy to know you liked this dill pickle soup! I had a lot of people laughing at me about this one, but they hadn’t tried it! Lol, my hubby was one of those people, and he tried it and likes it! Thanks for the review! What pressure setting low or high? High. Recipes will be high pressure unless otherwise stated. I made this for dinner last night and it was to die for! I had to *trick* the kids into eating it by not telling them it was pickle soup, once they were two bites in and loving it I told them – they were not pleased haha. I used Cook’s Pantry pickles for the recipe and it tasted delicious, what pickles do you prefer! I’m having the leftovers for lunch today, can’t wait! Thanks for sharing! Hahaha William! That’s so great! My mom tricked me into eating rabbit stew once. I hated that I liked it! For pickles I like the Mt. Olive brand. I canned my own pickles this summer, so I can’t wait to make this soup with those! Thank you for your review! Would it be wrong to also top off the soup with some bacon? Yes, and no, not wrong at all. Very delicious! This is the second recipe I’ve tried in our new Instant Pot, and the second time trying this particular recipe. We love it, however I can’t figure out how to make it creamier… What’s the secret? Thank you, Mike. I’m glad you like it! As for making it creamier, did you try making the flour/heavy cream slurry? If you do, add it while the soup is simmering as the heat will activate the thickening. Keep stirring!